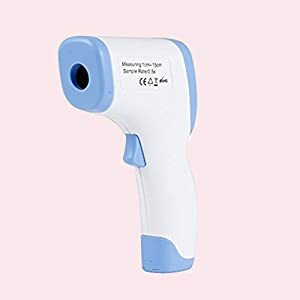 Scure Infrared forehead thermometer works by scanning heat on the temporal artery on the forehead. It is the latest technology that ensures you get an Accurate temperature reading in 3-5 seconds. It has both person and object mode. Object mode is very useful if one has to measure the temperature of baby bottle before giving milk to the child. The temperature can be measured in both celsius and fahrenheit mode. 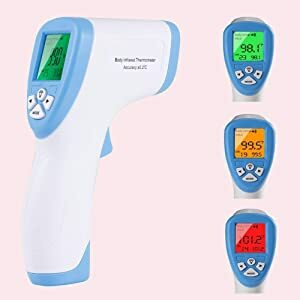 The unique feature of this thermometer is that it comes with 3 colored coded backlight that makes it easier to understand if the person is having normal temperature or having fever. Memory option, stores the last 30 measurements. The thermometer has been designed to be very easy to use. The thermometer being non invasive and giving accurate temperature readings is preferred choice of doctors and patients globally. Product suitable for all ages including babies. 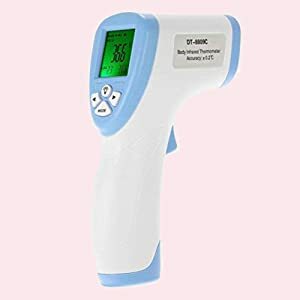 Medical Infrared Thermometer provides temperature readings without needing to come in direct contact. It is specially designed to take the body temperature of a person regardless of room temperature. Simply, point, aim and measure to get the results you need in seconds. 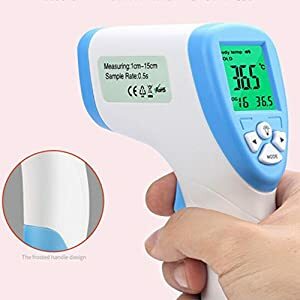 With this non-contact thermometer, you can easily take body temperature, surface temperature, and ambient room temperature without ever coming into contact with the object or person. A clear, backlit LED digital display provides accurate and easy to read recordings which can be read even in the dark. Get almost instantaneous readings with the quick infrared technology. It’s safe, efficent and completely reliable. ±1.5 degree calcius or 1.5%.